This GOQii Player Made the Impossible, Possible! 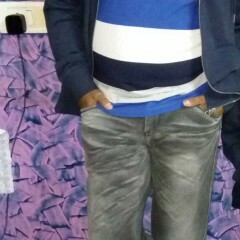 “If there is a will, there is a way”, GOQii player Avinash is a living example of this quote. This is the story of how the impossible was made possible with nothing but sheer determination to succeed. Avinash led a normal life post-retirement. 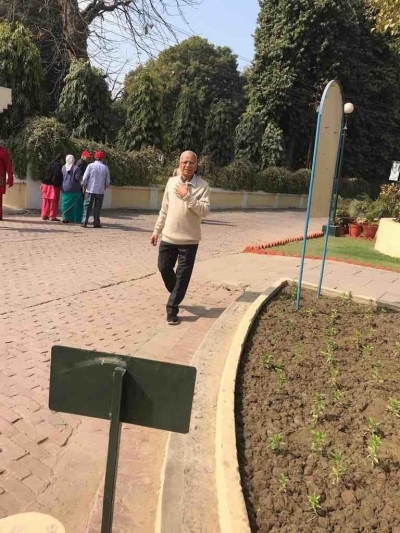 He starts his day at around 6 am in the morning, has his cup of tea and goes for a morning walk without fail. After his breakfast and lunch, Avinash takes a nap for around 2-3 hours, has dinner and goes to sleep. 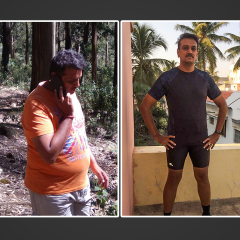 Things started getting difficult after Avinash was diagnosed with Type-2 Diabetes. His sugar levels were hovering around 160-175. Even though Avinash tried allopathy for a while, he wasn’t satisfied with the results and this forced him to consider other options. He decided to take a more holistic approach to his condition and considers it one of the best decisions of his life. “Already experimenting with Allopathy and Ayurveda, I was really disappointed with the results. I wasn’t really sure about GOQii in the beginning but today I’ve successfully reversed my diabetes and I’m no more a diabetic. The changes in my life were very basic but they made a drastic impact on my health and fitness. From my eating habits to the number of hours I slept, everything was closely monitored to bring out the best in me. The guidance and motivation provided by my coach is a big contributing factor to my achievement. I used to write a daily diary of physical activities, food intake and other activities, which I uploaded daily on the app. Based on the information, my coach guided and instructed me toward better fitness. I was determined to succeed and stuck to my goals with dedication. Due to this, I received a lot of appreciation from the coach regularly, which in fact was quite encouraging for me. As far as food intake and nutrition was concerned, I increased the number of proteins, fruits, vegetables, salads and reduced the quantity of wheat and rice in my daily diet. The quantity of these items was decided in such a way that I should not consume more than 1000 to 1200 calories in a day. I started consuming dry fruits like almonds, walnuts and seeds like pumpkin seeds, sunflower seeds and also started drinking Amla Juice every day in the morning. I detox my body regularly by drinking spinach, apple, mint and lemon juice twice or at least once a week. Spicy foods and junk are totally out of my diet and the results are marvellous. My water intake has increased from 1 to 1.5 litres to 2 to 2.5 liters a day. I walk for two to two and a half hours twice, every day. 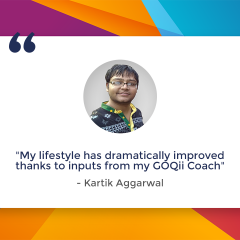 I have been achieving my daily target of 10,000 steps a day and 70,000 steps a week consistently since I joined GOQii. On many occasions, I have exceeded 100,000 steps in a week as well. I have been monitoring this with the help of a tracker provided by GOQii. Yoga and Art of Living programs have also become a healthy part of my life. What did Coach Trisha have to say about her player Avinash? This is an excellent example of how you can turn your life around. 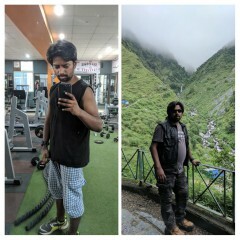 If you feel like you are not at your best health, may this story encourage you to work towards fitness! It always seems impossible until it’s done.